Synctag is a web agglomerator endorsed as a co-sell solution with Microsoft Inc. that helps to provide a scientific approach towards management of networks such as social, email, content and media (such as Facebook, Instagram, LinkedIn, Twitter, Youtube, Vimeo, Dailymotion, Any email networks and RSS integrations). 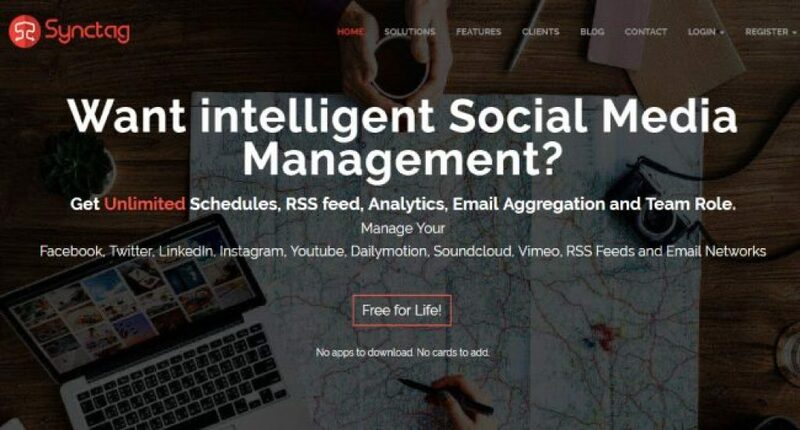 As we agglomerate multiple data points, our engine provides an integrated AI (Artificial Intelligence) based analytics to understand your Target Audience, Relevance of the campaign with the targeted audience, Sentiments that are derived from the campaigns, Keywords or Hashtags that are more viral towards the target audience. Synctag along with the niche strategist team are able to provide unique social media solutions to get a 20% above more ad delivery value for the ads on social media and campaign virality in a shorter time period. What problems does Synctag solve? Sentiment Analysis- Provides which keywords derive what kind of sentiment in the brand Target audience vs how relevant that keyword is. Keyword Analysis- This talks about keywords that are to be repeatedly used in the content of the brand to help create virality among the audience of the brand. Personality Analysis- To provide the characteristic of the audience on the brand page to help understand better the personality and habits thereby able to make buyer personas for the brand. The Personality analysis breaks up user conversation about the brand in multiple around 42 characters of human and then these are mapped along with Meyer Briggs human character analysis to provide the audience’s character along with their Strength and Weakness and what type of audience they can influence on the page. Tone Analysis- Tells the brand the way it has been communicating along with the user conversation analysis comparing how close is the brand tone with relevance to the target audience. Businesses looking for marketing strategy by pushing their brands, products or services through blogs, case studies, etc and showing companies how we create the required results. Using these ingredients in an effective manner we give them the best results effectively. We provide a platform for the companies to create a solution that can be integrated and used in their own platform module. By integrating our solutions, we aim to make their lives easier. Analysis of any raw data is our specialty, gets processed into information based on factors such as sentiments, emotions, tone, etc, of the customers. They get to know what is trending, how the consumers are reacting toward a brand, effective content and engagement strategy, and plan, etc. Any requirement can be custom processed with regards to technology, digital media space, business, etc. 5)In process of similar partnership with IBM and leading AI technology companies across the globe to provide accurate AI solution to clients through an aggregation model. 6) Expanded the product base from India to New Zealand on board 3 clients along with a TMP (Trusted Marketing Partner) for Synctag promotion in New Zealand. The partner shall onboard another 10 clients by April end with Synctag. 7) Synctag as a product has evolved past the digital marketing to more focused solutions in analytics, digital asset audits, platform aggregation across the web and considering the current product line to be able to provide data sets to help brands make much more value from the ads across the social media platforms. 1) Currently, the marketing team is aggressively working on providing brands with niche solutions and model. The Synctag team with the Microsoft co-sell team, Mr Abiram is working on to create models that could disrupt the current methods of ad proposition on social media for sectors such as E-Commerce, Retail stores, hospitality, hospitals and FMCG. 2) Plan to expand in foreign markets such as Australia, Ireland and UK by end of 2018. 3) To create more trusted marketing partners across India to be able to cater and provide niche solutions for Corporates and SME for Social ROI, Digital asset management and optimization. Moving further Synctag believes to be able to integrate all AI platforms into its portal to eventually provide the most accurate solutions on which engine provides the most relevant insights on social media data to make better decisions thereby resulting in higher ROI in terms of Brand awareness or leads or offline walk-ins and our plans don’t limit here. Harsh Mehta, Co-founder, and CEO of Adhash Technologies, has a background in Computer Technology, AI Engineering, cloud development. He is an enthusiast in Math, Physics and Computer Technology, always keen on pursuing his interests. This notion of aggregating all email and social media in one dashboard arose when in Canada. He framed a prototype of this product for around 8 times in Canada and failed. He returned to India and started his product and that’s when his father decided to venture jointly. Mr. Ashok Metha, Co-founder, and COO, owns an MBA major from Palm Beach University, Florida and has a predominant background in Textiles. He felt that whatever could be pursued in the Textile industry can also be done in various other industries. Even though the sector might differ, business ethics remains the same. He found that he was working in an overly crowded market and was still able to make exceptional numbers, why not in an industry where the volume of the target is huge, globally. That approach changed his mind to join with Synctag. He is a visionary with vast knowledge and takes care of the entire operations of all the departments in Synctag.